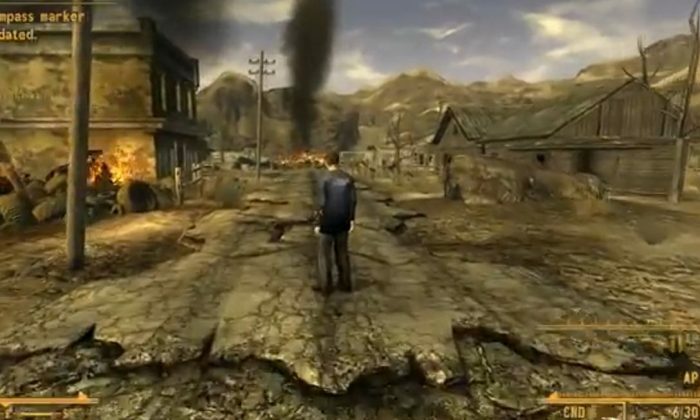 “Fallout 4”–or whatever the upcoming game is to be called–didn’t make an appearance at E3 last week, but recently, the lead designer for “Fallout: New Vegas” talked about what he’d like to do with the game. Bethesda hasn’t confirmed or denied that it’s making a new “Fallout” game, and there’s been a spate of rumors and hoaxes about it. Josh Sawyer, the lead designer and director of “Fallout: New Vegas,” didn’t reveal much to Eurogamer about an upcoming game, but he talked about what he’d like to do next. “Ho! I don’t know! My concerns are usually about a couple of things,” he said, according to the website. Sawyer talked about previous “Fallout” endings. “Also, you see that in the Road Warrior [Mad Max] films; Max, even when he wins, just goes on being a wanderer. There’s that kind of bitter-sweet victory in the difficult choices that people make. Regardless of what the setting is, I would hope that that is a big part of the storytelling of it,” he said. In “Fallout 4,” Sawyer said he’d like to see similar difficult choices in the next game. And Bethesda Softworks’ Todd Howard recently talked about an upcoming “Fallout” game. “We get asked a lot, I sort of tell people we’re figuring things out. We’re taking our time, we’re extremely excited about it and the reason we’re kind of holding back right now is because we want to wait until it’s really there to show it to everybody,” he said in a YouTube video, according to the GameRanx website.